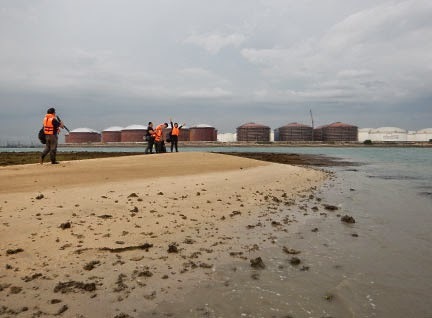 Today we return to Terumbu Hantu to check for damage by the MV Nautica. 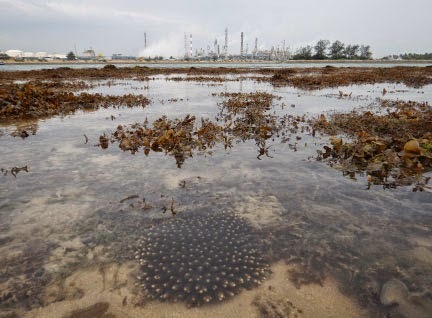 Despite being very close to the petrochemical plants on Pulau Bukom, Pulau Hantu and the submerged reefs nearby have delicate corals and other animals in the shallow areas. 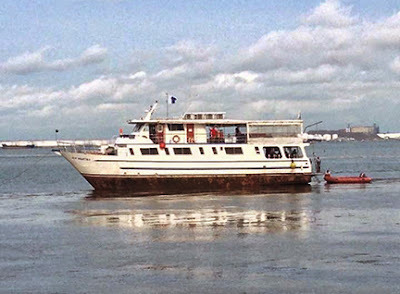 This is a photo of the MV Nautica a large live-aboard dive boat which was seen high and dry on the living reefs of Terumbu Hantu on 9 Nov 2014. Photo by Toh Chay Hoon on facebook. 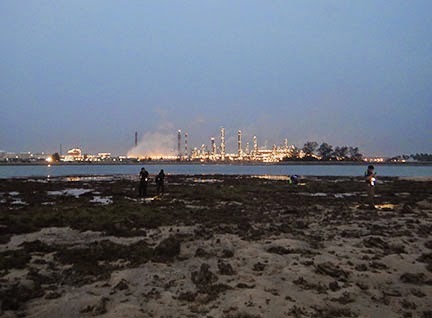 When we landed on Terumbu Hantu, we could see a large trench amidst the sargassum where the MV Nautica was seen in November. 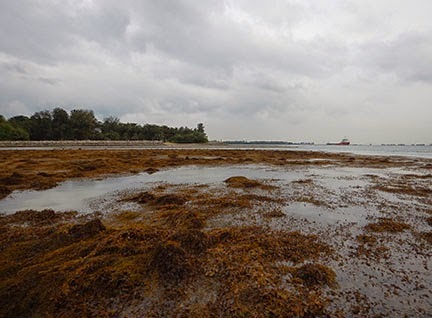 But there was a massive growth of sargassum on the entire reef, so it was hard to tell if there was any serious damage. Almost immediately after we landed, for the safety of the shore (we didn't want to step on corals under the seaweeds) and our safety (did NOT want to step on Mr Stonefish), we transferred to the sandy Terumbu With No Name. 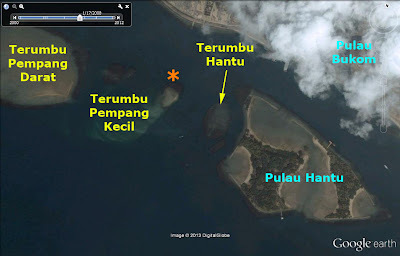 We last visited both Terumbu Hantu and Terumbu Pempang Kecil in Jun 2013. 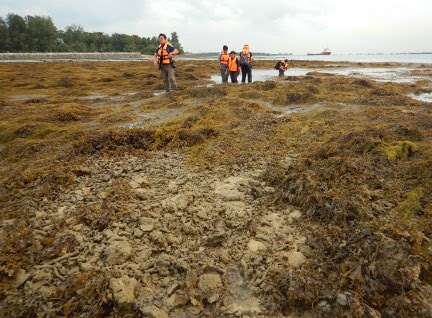 The sandy submerged reef marked with an orange * which we surveyed is one of the two unnamed reefs marked as Terumbu Pempang Kecil on the navigation maps. 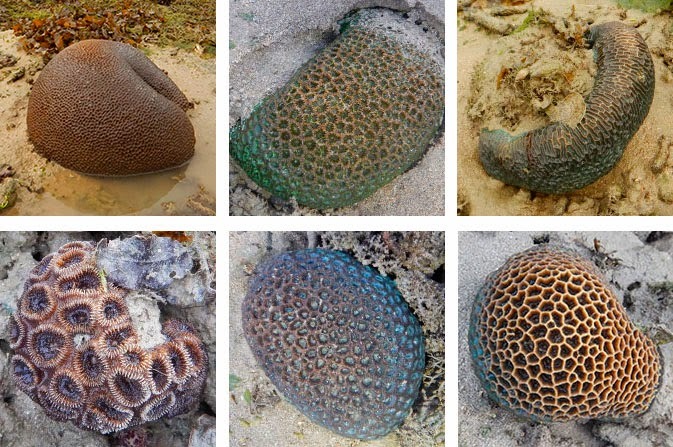 As usual, the most common corals were Favids of various colours and patterns. I didn't see any bleaching corals. 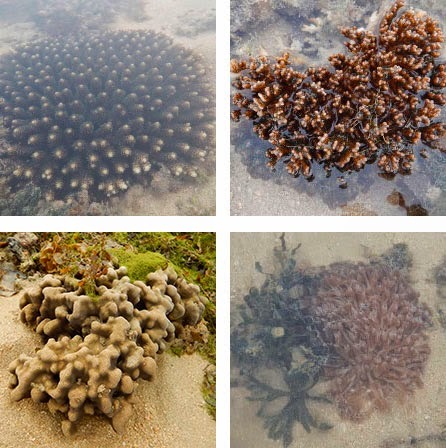 There was a nice colony of Acropora coral, also Cauliflower coral, Pore coral and Anemone corals. I even saw mushroom corals: A circular mushroom coral and a Mole mushroom coral. 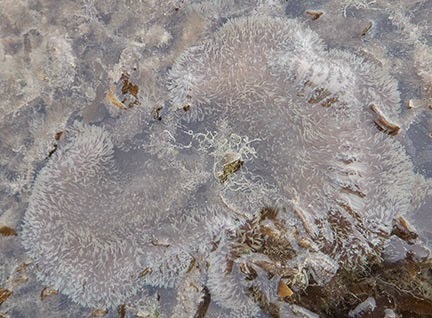 There were also several small leathery soft corals, and Asparagus flowery soft corals. They were all not bleaching. A Giant carpet anemone, but alas, I couldn't find any 'Nemos' in it. There were also Frilly anemones and Chay Hoon found an Alicia anemone. 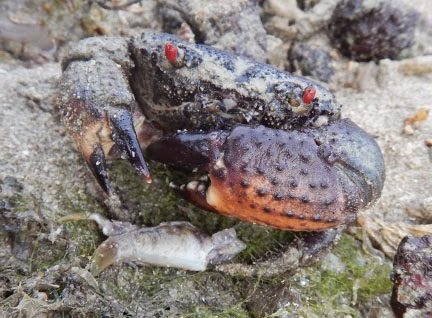 I came across a Ferocious reef crab having a meal of a small fish. 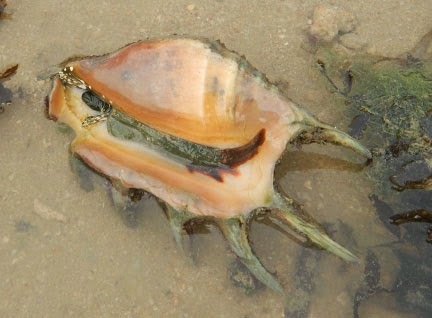 Jianlin found a Spider conch! And shared a great video clip of it hopping. The rest of the team also found special flatworms, fishes and more. As it got dark, I had a look under the stones. 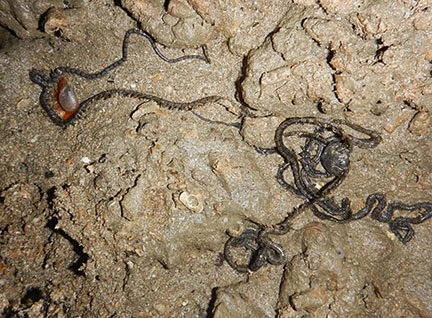 There were many Very long armed brittle stars, and under this one, a Swimming file clam too. 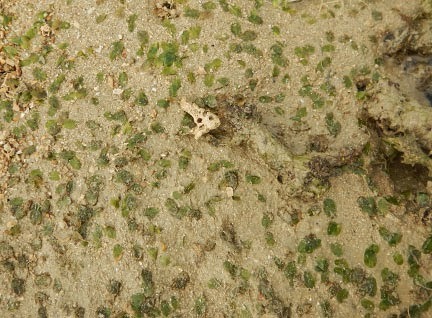 There's many patches of Spoon seagrass with tiny leaves. Because of the huge sand bar, it is easy to land and depart from the Terumbu, so we stayed until the very last bit of sunset. 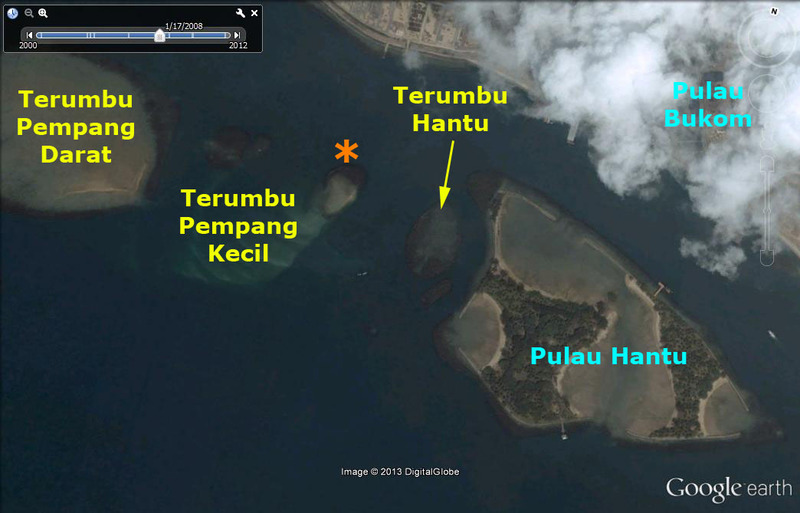 Let's hope all is ok at Terumbu Hantu as we won't have a chance to visit it for some time. 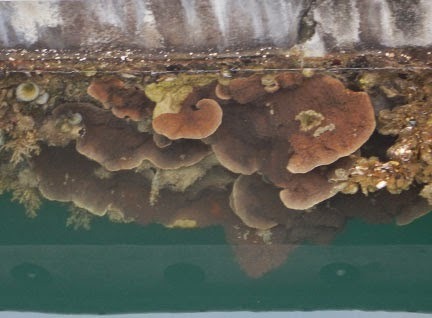 At Marina at Keppel Bay, the corals growing on the sides of the pontoon looked happy and were not bleaching. Juria rushed over from her work meeting to join us. Thus she now holds the title of the "Worst Dressed for a Field Trip". Just with the shoes alone. Jerome Lim on his blog.